This past Saturday, my boyfriend and I decided we want to hit up a local diner's $1.99 breakfast to try something new (and thrifty). As soon as we were escorted to our table, our server called to us from afar, asking what drinks we would like. I panicked. Normally, I have sufficient time to glance over the menu to see if the place's drink prices are acceptable. I searched and searched the menu and could not find any prices. 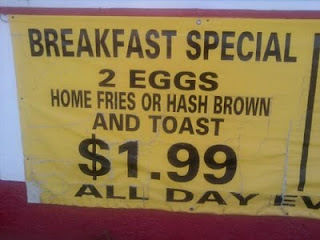 So, I decided, well, it's a cheapo diner, the drinks should be cheapo as well. "I'll take an orange juice" I responded, figuring I'd live on the edge. To my dismay, I finally found the drink prices on the back of the menu and saw that my OJ cost $2.29. 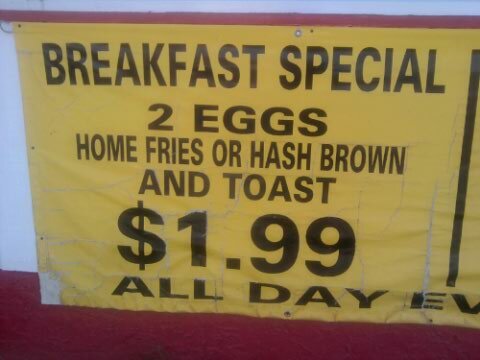 That's a full 20 cents MORE than the prices of my 2 eggs, home fries and toast meal! I was even more shocked when she brought out my OJ in a teensy little glass; it must have been only 6 ounces of juice. Restaurant drink prices in the past few years have gone out of control. Just a few years ago it was unheard of to be charged more than $2 for a Coke or lemonade, now places are charging anywhere from $2.29-2.49 for a soda. I've seen up to $3.99 for a flavored lemonade. Restaurants are making absolute bank on us. The cost for a restaurant to deliver a customer a soda is only 12-15 cents per glass; that's about $2 profit assuming you only get 1 refill. That is immoral, unacceptable and just plain robbery. How do you avoid this beverage baloney? Get in the habit of asking for water. Your wallet and your stomach will thank you for it.